Discussion in 'Muppet Headlines' started by Phillip, Oct 6, 2015. 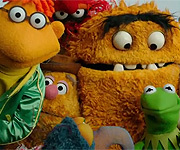 What did you think of "The Muppets" episode "Bear Left Then Bear Write"? Why are people still hating on the new muppet show episode 3 did not seem to me to have anything bad to it. I would rather watch this show then a show like family guy. Ugh, the hate for this show is getting annoying. Oh no the muppets are drinking, they have not done that before. The very image of an alcoholic beverage in something as innocent as the muppets would be atrocious. After Sesame Street, Jim Henson began to delvelope a series that would become just as successful, so in 1976, he launched a new children's series for children called The Muppet Show. His goal was to be as wholesome and clean as possible. Kids were entertained, and it was all good. This new muppet show is against everything Jim Henson worked for, the thought of having mild sexual references, and one use of the h**l in one episode is an abomination to everyone who has ever worked with the muppets. Please do not let this abomination of the muppets get into your viewing range, instead chose more wholesome options like The Big Bang Theory, so we can all forget about this. LouisTheOtter, FletchySRF3088, LaRanaRene and 2 others like this. Yes! I absolutely agree! This show is better than Family Guy and that's a fact! Grovette, LouisTheOtter, FletchySRF3088 and 2 others like this. I addressed this earlier (no problem if you didn't see). It's a question of class. It's one thing to show Kermit and Piggy as two adults drinking wine during a romantic dinner. This new show would think it's funny to have Piggy fall off the chair drunk while Kermit makes a rude comment that's supposedly funny. Guys, seriously, we "haters" have been watching the Muppets our entire lives. We are aware that they're not just for kids. That is precisely why we aren't that impressed with this show, because we don't feel it's particularly adult. I don't know how else we can explain it. Ok so what would you change about the show ? I'd say learn a thing or two from other franchises that have successfully reinvented themselves, like the Transformers franchise (Transformers, not Bayformers!). Transformers Prime is a modern show that managed to explore more mature themes while still maintaining the innocence of the original G1 series. Hasbro has enough faith in, and understanding of, their product to keep what worked, nix what didn't, and expand on the possibilities of a new era. They're also aware that their audience doesn't want to meet strangers. They want the characters they've come to love. I wasn't going to bother replying anything in this thread, but this just stuck in my craw. Do you really think if this show isn't successful, as well as the last movie not being one, Disney's going to keep making Muppet projects when they have far more successful properties to milk cash out of? Okay, remember the last Muppet TV show? Remember how long ago that was? 20 years. Not for the lack of effort on Henson's part in the 00's, but there hasn't been a show since MT. To think that if this show doesn't succeed that Disney will say "Hey! Let's reboot them again in a couple years" is a little naive, wouldn't you say? Why should they even bother with a franchise that at best will sell a couple t-shirts when you have Star Wars and Marvel basically pooping out gold? The fact that they even tried another venue for the characters after the last movie bombed pretty much says they were last ditch. Seriously. I hate to say this, but there's a reason hard cor Disney fans and stock holders kinda hate the Muppets and Disney's acquisition of them. At best, if this show doesn't do well, we're looking at maybe one or two Christmas specials we won't like anyway, and maybe a few years down the road a Made for TV movie that won't be that good. All I'm saying is, I don't have the patience for another 20 year wait for a TV show that won't be successful and half the fanbase will hate. there's a reason hard cor Disney fans and stock holders kinda hate the Muppets and Disney's acquisition of them. I'm a stock holder and right now I kinda hate Disney for not having a clue what to do with the Muppets, lol. And this is why I'm sick of defending anything. Just...just stop watching. Watch the Flash. Everyone that hates this show because it's incredibly offensive somehow, just watch the Flash. Or your old VHS's. Just stop looking for crap to complain about. Chances are no matter what they do, half the fanbase isn't going to like it. It's not like Henson knew what to do with them either. I bring this example up every darn time and everyone's sick of hearing it, but MWO. That was a thousand times more offensive, non-Muppety, and poorly done than this show could ever be accused of. Why do I keep bringing this thing up? It's exactly what Henson would have done had they still had the characters. More crappy remakes of old stories that need not be remade peppered with juvenile humor that makes even the worst, most awkward joke in this current show look sophisticated. All starring D list celebrities that can't act their way out of a tissue paper bag. Disney not knowing what to do with the Muppets? Henson doesn't know what to do with Henson. Unless it's a CGI series, they can't get one project off the ground or to last more than a week. They've been saying since 1991. And I get the dang point. God knows we've been bludgeoned with it long enough. That said, I personally hope whatever the next Muppet project is, it's as saccharine and syrupy as LTS was. You know, the one where Gonzo mopes around like Eeyore for 40 minutes? LittleJerry92, Duke Remington, Muppy and 1 other person like this. Again, you're not the only one defending something here. No offense, we're cool and all, but quit being the Muppet martyr. 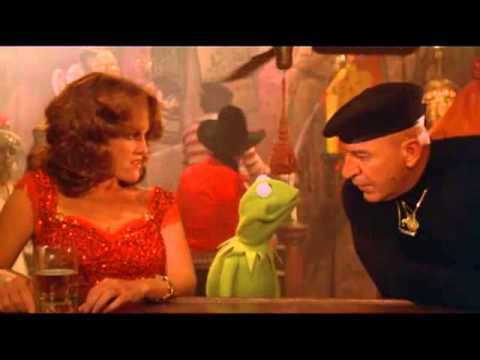 Well, if you can't see the difference in context between Kermit and Miss Piggy having a drink while getting to know each other in the Muppet Movie and the Muppets going out and getting totally plastered, not showing up for work or showing up for work hungover as in tonight's episode there's really no point in discussing this anymore. There's a big big difference in the character of the Muppets in the two scenes. I kinda liken it to this. 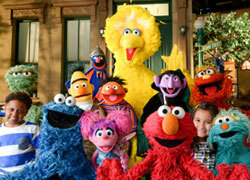 Remember the on-line videos of the Sesame Street characters doing obscene things that are out there? Bert and Ernie in bed together? Oscar flipping the bird? The supposed humor in those is the contrast between the innocence of the Sesame Street characters and the obscene gestures they are portraying. It's almost like that's what the writers are striving for. Fozzie as a thief. The Electric Mayhem as stoners. The Muppet gang getting plastered. I don't have a problem with edgy humor from the Muppets but so far I've seen mostly sophomoric humor and lazy writing. They can do much better. And I'm kinda sick of anybody that is critical of the new show being labeled as non-Muppet fans. If anything, they are proving themselves to be very dedicated Muppet fans as they aren't willing to accept anything from the Muppets and care very much for how they are treated. It is possible to still love the Muppets and be critical of them at the same time. LittleJerry92 and CensoredAlso like this. I kinda liken it to this. Remember the on-line videos of the Sesame Street characters doing obscene things that are out there? Bert and Ernie in bed together? Oscar flipping the bird? The supposed humor in those is the contrast between the innocence of the Sesame Street characters and the obscene gestures they are portraying. It's almost like that's what the writers are striving for. Yup, I said that earlier, and I think you might have something there. The network probably is feeling threatened by the Internet as usual and thinks it can compete somehow by copying what young people seek online. But yeah, just because I enjoy the occasional off color parody doesn't mean I want to see it coming from the actual Muppets, lol. Oh my gosh, so adults can not get drunk, wow, the muppets probably got drunk at some point "BEHIND THE SCENES" which is exactly what the point of the show is, if you're not happy with this then watch those disney junior muppet shorts that certainly do the muppets justice by making them another version of SS, if TMS was made today it would be more adult, because back then you couldn't do much on television that was edgy, The Electric Mayhem has always been implied as stoners. Fozzie, a theif, ya like he totally broke into Jay Leno's house, and held everyone at gunpoint, and shot Jay Leno unti he gave him a bowl. His intentions were not brutal, he was just exicted, sheesh, all he did was take a little bowl, and WANT to give it back, he was naive and I would expect that is how Fozzie would react, but if you're going to hate on the muppets for getting drunk and having mild sexual references then that's your opinion not mine, it was marketed as a more adult muppet show. Big Bird Fan likes this. See, here we go again. Anybody that is critical of the new show is labeled as a hater and told to go elsewhere. And if you think Kermit bragging about being one of the best at manipulating people is true to his character then I don't know what else to say. No one said that. Again, it's a question of execution. Serious question, what other way can we make it clear that we like it when the Muppets are edgy? This is getting beyond silly. How you watched much '70s Television? The opposite is true. The Electric Mayhem has always been implied as stoners. We've been defending the Muppets actually, whether it's referencing Rainbow Connection, Muppets Take Manhattan, or The Muppet Show. On no planet is that hating...except Koozebane maybe. I haven't had a chance to comment on this episode yet and even though I'm a week late (and will soon be commenting on "Pig Out") I think it's worth offering some thoughts. From where I sit, this installment arguably did more to add layers to an existing Muppet relationship than any of the other three (although Piggy-and-Kermit in the first episode and Fozzie-and-Statler in "Pig Out" come close). The way the writers and especially Steve and Eric as the performers handled the Kermit-and-Fozzie dynamic not only made me laugh out loud at several points but felt so true to the chemistry that the frog and the bear have had for the past 39 years. Kermit desperately doesn't want to hurt Fozzie's feelings but he also doesn't want the show to tank because of Fozzie's lousy sketch. That plotline could have come from pretty much anytime in the past 40 years. It shows that the writers and producers care about these characters and want us to keep caring about them, too. So many wonderful little moments came out of that whole story - K&F "You the man!," Kermit trying to help Fozzie turn off his phone, "Hopefully if I hide in here, he'll think I'm a baseball trophy," "Maybe I can use THESE to look for my hat," "Once I licked my cousin and the walls started melting..."
Good use of the guest stars in this episode too. Liam Hemsworth spoofing his matinee-idol status, Christina Applegate pretty much killing every single scene she was in (echoing another MC post on this topic: I, too, would watch a buddy-comedy movie with her and Scooter), and Nick Offerman making ridiculous demands. I would have liked to see more of him but then I just miss Parks and Rec, particularly Ron Swanson, so maybe I'm a bit biased. Obviously this show still stirs up high emotion on either side of the Muppet fandom but, from where I sit, so far, so GREAT!!! Just a heads up: Bob Kushell tweeted not long ago that Denise will be returning very soon. Maybe next episode??? LittleJerry92, FletchySRF3088, LouisTheOtter and 2 others like this. LittleJerry92, MUPPETFAN1976 and JimAndFrank like this. Well, you seem so enthusiastic about that, don't you? Come on. If she wasn't Kermit's new GF and if she had the magic triangle, everyone would think that she's an enjoyable character. To quote JD Hansel, "Right from the beginning when she says her first line, which is a little joke and she follows it up with a cute bu-dum-cha, it's like oh, gosh, I love you."